International investments continue their performance leadership in 2017, helped by broad global growth, a weaker U.S. dollar and lower valuations than U.S. stocks. The S&P 500® Index of U.S. large-cap stocks remains on track for its strongest year since 2013 as volatility stays on hiatus. Less traditional bond asset classes such as high-yield bonds and emerging markets debt deliver strong returns, illustrating the benefits of diversification beyond core bonds. Fundamental and market-cap indexing split performance leadership, demonstrating why Schwab Intelligent Portfolios includes both forms of indexing for diversification. All portfolios across the risk spectrum, from conservative to aggressive, deliver positive returns during Q3 2017 and YTD. How did financial markets do in Q3 2017? Financial markets saw a shift back toward U.S. performance leadership in the final month of Q3. U.S. stocks jumped in September as potential tax reform took center stage. U.S. small-cap stocks were the biggest beneficiary, surging to the top of the performance charts in September after having moved mostly sideways throughout 2017. The S&P 500 Index posted its eighth consecutive quarter of positive returns, remaining on track for its strongest year since 2013. While the winds appeared to be shifting back in favor of U.S. investments at quarter-end, international investments again led for the quarter as a whole. As Figure 1 illustrates, emerging markets remained the top performer for Q3 and YTD, aided by the broadest global growth in 10 years, with no major economies in recession. International stocks have also benefited from a tailwind of lower valuations than the U.S. stock market and a weaker dollar so far in 2017, although the dollar strengthened slightly in September. Defensive asset classes such as gold played their intended role during a brief uptick in volatility in August, but risk appetites appeared to be increasing again at quarter-end. The S&P 500 Index has now gone more than a year without a pullback of at least 5%. While not unprecedented, this placidity is uncommon, and volatility is likely to increase in coming months. Whether the calm continues during the fourth quarter or markets potentially become more turbulent, a diversified investment approach such as that of Schwab Intelligent Portfolios is designed to help moderate potential volatility so that you can stay focused on your longer-term financial goals. Source: Morningstar Direct, as of September 30, 2017. Performance figures shown are total returns for each asset class during the designated period. 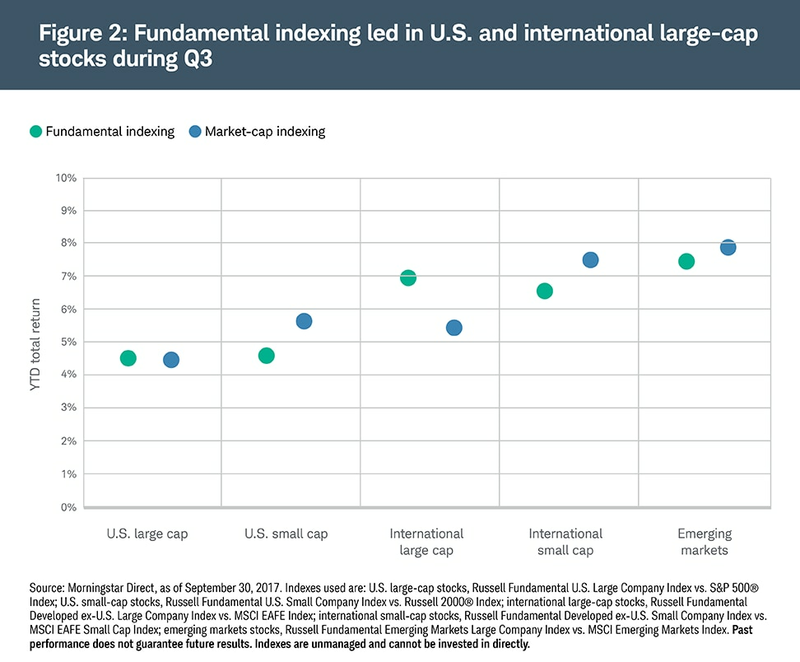 Indexes used are emerging markets stocks, MSCI Emerging Markets Index; international small-cap stocks, MSCI EAFE small-cap Index; U.S. small-cap stocks, Russell 2000® Index; international developed market large-cap stocks, MSCI EAFE Index; U.S. large-cap stocks, S&P 500® Index; gold and other precious metals, S&P GSCI Precious Metals Index; emerging markets debt, Bloomberg Barclays Emerging Markets Local Currency Government Bond Index; international bonds, Bloomberg Barclays Global Aggregate ex-USD Bond Index; high yield bonds, Bloomberg Barclays High Yield Very Liquid Index; investment-grade corporate bonds, Bloomberg Barclays U.S. Corporate Investment Grade Index; U.S. real estate investment trusts, S&P United States REIT Index; U.S. Treasuries, Bloomberg Barclays U.S. Treasury 3-7 Year Bond Index.Past performance does not guarantee future results. Indexes are unmanaged and cannot be invested in directly. Interest-rate sensitive investments such as bonds and REITs came under pressure in September as the Fed announced that it would begin to shrink its $4.5 trillion balance sheet in October. The Fed also appeared poised for a potential rate hike in December and forecast three quarter-point increases in 2018. However, high-yield bonds still delivered a positive return in September, illustrating the benefits of diversification beyond core bonds. While long-term interest rates moved upward in September, they’re lower than at the beginning of 2017 even as the Fed has gradually raised short-term rates. For example, the yield on the 10-year Treasury declined from 2.45% at the beginning of the year to 2.33% at the end of September. Though the Fed is expected to continue to raise rates at a gradual pace going forward, it’s important to remember that bonds play an important role in a diversified portfolio in delivering income and helping to moderate stock market volatility. Fundamental indexing showed signs of returning to favor during Q3, splitting performance leadership with market-cap indexing across the five major equity asset classes where we include both forms of index investments.2 Fundamental indexing led strongly in international large-cap stocks and by a small amount in U.S. large-cap stocks, while market-cap indexing led in the other three asset classes. For the YTD period, market-cap indexing remains ahead, which contrasts with 2016 when fundamental indexing significantly outperformed. These shifts in performance leadership illustrate how a combination of both fundamental and market-cap indexing in a portfolio can help provide additional diversification. Each of these forms of index investing tends to lead in different market environments, so including both within a portfolio can enhance diversification while retaining the benefits of indexing such as low costs, transparency and tax efficiency. All portfolios across the risk spectrum again delivered positive returns for Q3 and YTD 2017. With equity markets continuing to advance during the quarter, the most aggressive portfolios were the strongest performers due to their larger allocations to stocks and non-traditional bonds such as emerging markets debt and high-yield bonds. More conservative portfolios saw more moderate gains while also delivering their intended lower volatility. Heading into the final quarter of 2017, Schwab’s view remains optimistic as the fundamental trends that have driven stocks higher remain intact. While the bull market is now more than eight years old, it continues to be supported by strong corporate earnings growth in recent quarters and broad global economic growth. However, risks of a pullback exist amid signs of investor complacency and heightened political and geopolitical uncertainties. While recession risk still appears relatively low, it remains to be seen how markets will react as the Fed begins to shrink its balance sheet. During periods of steadily rising markets, it’s important to remember that markets are volatile by nature. The extended period of exceptionally low volatility is unlikely to continue and may give way to bouts of turbulence in coming months. Investing in a diversified portfolio consistent with your goals and risk tolerance and maintaining the discipline to navigate through these inevitable periods of turbulence while sticking with your financial plan are among the keys to long-term investment success.